Market nichers seek to concentrate on small segments of the market and deliver superior value for customers in that specific market niche. What are the ways to specialize for market niches? In order to occupy a certain small segment of the market and provide superior customer value, specific strategies are needed. In this article, we will investigate how market niches can be occupied by looking at ways to specialize for market niches in more detail. Market nichers seek to concentrate on small segments of the market, usually segments that are so small and specialised that the market leaders cannot or will not service them. Market nichers are often highly effective in satisfying specific customer needs and rather successful in their niche as competitors are often closed out of the niche: the market nicher develops an intimate knowledge of customer needs in a very specialised area. This intimate knowledge is rather hard to match for new entrants. In addition, the niche is often too small to support more than one company, so there is little to be gained by trying to capture it from an established nicher. However, to be successful in delivering superior customer value in such a niche, the right strategies need to be chosen. 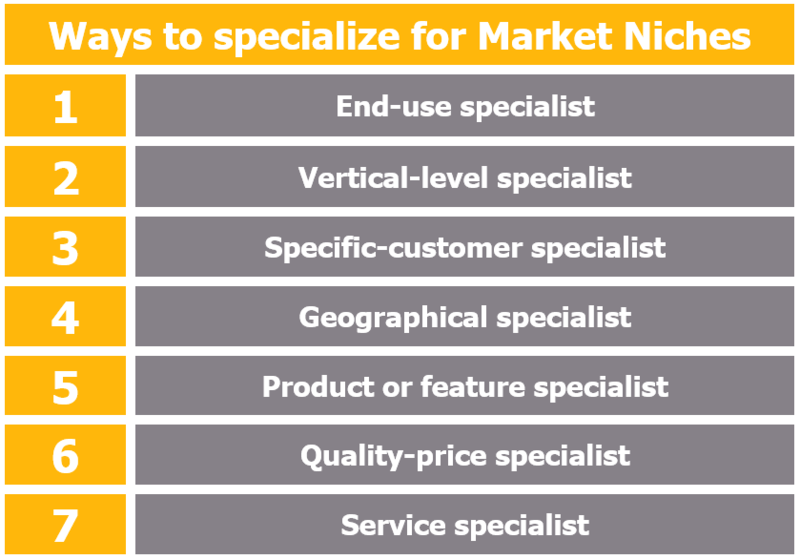 There are different ways to specialize for market niches, which we will investigate in the following. Let’s go through each of these ways to specialize for market niches in more detail. The firm specialises in meeting all the needs of one type of end-user. For example, the German company Tennispoint aims to supply all the needs of tennis players and thereby outperforms general sports suppliers in that specific segment. The firm specialises in one level of the production–distribution cycle. For example, heavy transport firms specialise in moving heavy machinery and abnormal loads. They not only have the specialist vehicles for doing this, they also have knowledge of procedures for alerting police, closing off roads, removing obstacles and so forth. The firm specialises in supplying one or two much larger firms with specialist services or products. For example, Weber carburettors supply high-performance carburettors to most prestige car manufacturers. It is not worthwhile for the car manufacturers to produce their own carburettors. The firm might stay within a small geographical area, as does the London Underground. Another example is Welsh-language publishing, which has virtually no market outside Wales and Argentina. These firms specialise in producing a particular product, or one with unique features. This strategy is typical for firms with strong intellectual property rights, such as a patent. These firms look for a niche at the bottom or the top of a market, either producing the cheapest, most basic version or (more commonly) supplying the highest-quality product. For example, the market for executive jet aircraft is dominated by Learjet. These firms offer services that are not available elsewhere. The Russian Space Agency, for example, is the only organisation offering tourist trips into space at present – although other firms are expected to enter the market in the next few years.